A couple side notes: last week we drank Fentimans ginger beer. It was delicious and is what I’d choose. But our store was out so Donna got Barritt’s (diet, no less, yikes! ), which originated in Bermuda, and so is appropriate for this rum (even the diet part—it tasted good). And an observation on limes: choose the ones with the smoothest, shiniest skins: less skin, more juice. The Dark and Stormy is a most excellent warm-weather drink. It’s the drink of choice when I go down to Key West to write and to cook for the boys (and girl) who race in the January regattas there. This one has a goodly quantity of rum. If you’re like the boys on the boat, it’s a nice start. Pour the rum into a highball glass and fill the glass with ice. Add the ginger beer and the fat wedge of lime. Previous cocktail posts for your reference: the excellent Whiskey Sour (with egg white); one of the oldest and best for its simplicity, the Old Fashioned; and a cocktail of my own devising, The Berkshire Martinez (which, happily, has made it onto the drinks menu at the VTR!). My post on another popular drink, coffee, in Percolator Re-Love. Rum and its history from Slate Magazine. One of the most interesting Dark and Stormy’s that I have had was at Aviary in Chicago. Bermuda’s Barritt’s ginger beer shares the history of ginger beer, which is originally from England. © 2012 Michael Ruhlman. Photo © 2012 Donna Turner-Ruhlman. All rights reserved. I love a Dark and Stormy, but while I rarely keep rum around, I always have bourbon… I think I’ll pick up some ginger beer today and try that variation. With bourbon and ginger beer, I usually go with a half of a lemon instead of the wedge of lime. Very refreshing. Makes sense, thanks for the tip! agree on the lemon with whiskey! Ooh, will def have to try this drink variation! This is one of my favorite summer cocktails. I usually use Reed’s Extra Ginger Brew – All Natural Jamaican Style Ginger Beer. I actually happened to be in Akron last week for a wedding, which was held at the Akron Art Museum. It was a lovely event, and the highlighted cocktail was – believe it or not – a Moscow Mule, so I didn’t have too long to try one after your post. Can’t want to see what’s up for next week! Have a great weekend. I will toast you and Donna on the porch on Saturday night. P.S. I like a perfect Rob Roy. Perfect summer beverage! Try making your own ginger beer – couldn’t be easier! Most ginger beer is not fermented. If you do go the ‘fermented’ route, you want a ginger beer plant, not bread yeast and especially not champagne yeast. It kills all the other yeast around and there are some delicious things growing on ginger. Regular ale yeast, especially English, works well. However, the vast majority of commercial Ginger beer is non-alcoholic and not fermented. You want a ‘pastuerized’ or product with carbonation. Don’t let people fool you about the alcoholic content. Fermentation is not magic and just b/c you want something not to be alcoholic, fatty, gluten-ridden, doesn’t make it so. A cup of sugar (~200g) in a quart of water will give you the potential of a beverage with 10% alcohol…or there about. Even if you only let it go a day or two you still have around 2-6% alcohol (YMMV, temp, etc). If you are chucking in more delicious alcohol, then you don’t care. If you are giving it to your kids, some probably would. Its dangerous, less asinine, to suggest to people who are not used to fermentation to cap a glass jug during active fermentation, which is not rated for pressure, chuck it in the fridge and ‘open it every few days to release pressure’. My buddy got 20 stitches in his face from an exploding bottle b/c someone followed interweb advice. Alex, this is no burn on you bud. Michael, sorry for the rant. C’mon, this is Friday cocktail post, lighten up. I just put some sourdough starter in and it fermented just fine, or as the recipe says, you can add the ingredients to carbonated water and make it fizzy if your a wuss. You better believe the dark and stormy is an official cocktail. It is delicious and deserves the designation. In fact, I’ll be skipping the traditional Friday wine run and buy some ginger beer instead. Thank you for featuring this wonderful summer cocktail! Nobody else in my family will touch these and they think I’m crazy for loving them. It’s such a refreshing combination and I love a little extra lime in mine. Cheers! I love these cocktail posts Michael! You’ve done your part to make our summer more relaxing! I made one of these after reading your Key West post. I used the same rum, a ginger simple syrup and homemade key lime bitters. And I tried the easy mix with half ginger beer, a little sweet for me but very refreshing and a great use of rum. Of course the environment plays a large roll in the enjoyment factor. Key west in December is a lot different than Seattle in December, but what a great way to ease the winter blues and lighten the mood. My favorite source of ginger recipes is that amazing chef Ming Tsai. He makes a lot of ginger drinks on his show and is the master of all things ginger, his little tweaks make the ordinary become extraordinary. Although it’s off the subject, I’m going to mention how much I enjoyed the book recommendation The Things They Carried. How did I not read this 20 years ago when it came out, right around Desert Storm when I was flying non stop to the middle east, desperate for a good book? I was reading Catcher In The Rye and Tom Clancy crap just to occupy dead space on long flights. Maybe I saw it and suspected the usual fraud of someone trying to capitalize on the time of war for marketing profit and turned my nose up at it. I know I would have enjoyed reading it, but I think it is even more relevant today, I know I appreciate it more now than I would have at that time. Such a great read, again, many thanks! Is there a reason your instructions often say to add booze to the glass before the ice? Presumably because he is using a scale. This has been my favorite cocktail for years. It is currently being edged out by a Whiskey Smash, but will always be high up there. It really is good and easy to whip up a weekly batch. Most excellent! PET is absolutely the way to go for bottling. You can easily bottle condition and pasteurize them in a hot water bath so you don’t need to ferment at all if you didn’t want. You have now become part of my regular Friday routine. Last thing before I shut down the office, check for this week’s drink. Next stop, ginger beer and then home. Thank you Michael. How is it we haven’t seen the Sazerac yet? I consider that the original cocktail. I was really hoping you’d follow-up the Mule with this. There is no other drink that takes me mentally to an island state of mind than a Dark and Stormy. I love a Dark & Stormy. Perfect summer drink… only suggestion is to try Sailor Jerry’s dark spiced rum. Paladar’s Dark & Stormy is wonderful. For the best Dark & Stormy use Bundaberg Rum (Bundy) and Bundaberg Ginger Beer. Both made in a small Australian country town. Unfortunately I don’t think you can get Bundy Rum here, but the Ginger Beer can be found @ World Market. A dark and stormy made with bourbon (or brandy) has long been called a horse’s neck, which is a widely recognized cocktail. My son came up from New Orleans a couple of weeks ago and made a superlative one with Buffalo Trace bourbon, Blenheim’s Ginger Ale, and lemon peel. I get that authentic recipes use a ginger beer plant, but this is far more practical. The author, Jeffrey Morgenthaler is also a great resource for a lot of other topics on cocktails and mixery. Gosling’s, pictured above, also makes a solid ginger beer. 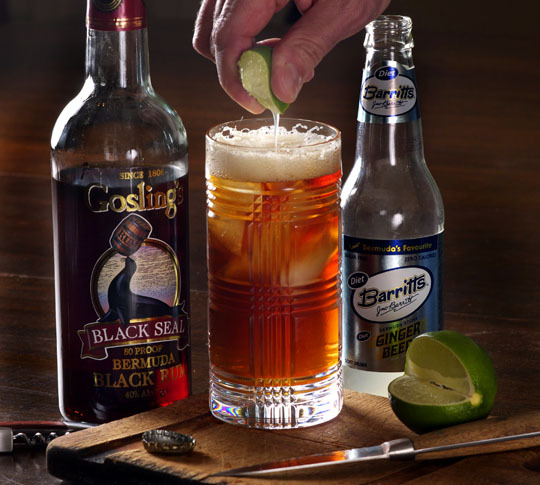 For a dark and stormy, it’s a bit more fun and tastier to squeeze half a lime into a collins glass filled with ice, add ginger beer, and top it with about 1.5-2oz of dark rum. The rum will slowly make its way into the mixture, but will start off looking like a storm cloud.